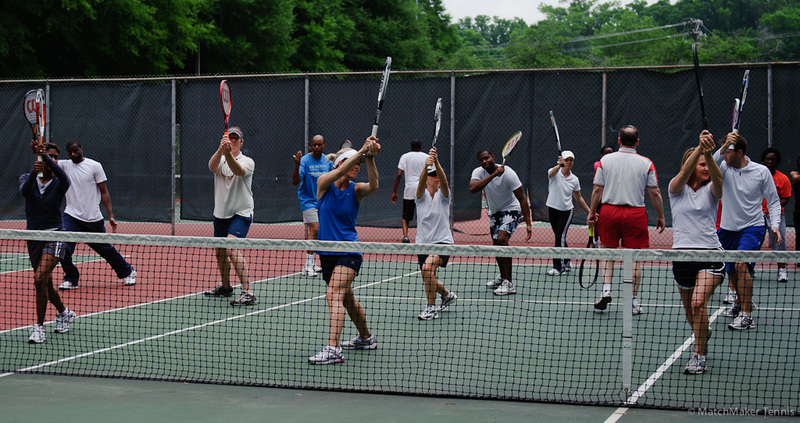 MatchMaker Tennis is offering free tennis classes for beginners throughout the summer. The next session is this Saturday, 10 a.m. at Freedom Park in Dilworth, 1900 East Blvd. The classes are open to adults and all you have to do is sign up on their website and show up with a tennis racquet. Visit www.matchmakertennis.com for more details or go directly to their events calendar. I attended this MatchMaker Tennis class last summer (that's me on the far left). Gotta work on my form. Photo via matchmakertennis.com. This Saturday, the instructor will be teaching the serve and forehand; next Saturday, it's the backhand and volley. I attended a couple of classes last summer and really enjoyed it. Tennis is certainly a sport of skill, but you'll be comfortable at these beginner classes because most of the other attendees are just as uncoordinated and green as you. Plus, this could be a way for you to get in some exercise. If you're more seasoned or want to become more active, you should consider becoming a member of MatchMaker Tennis, for $15 a month, and you can participate in leagues, clinics, social events, and more.